Fire protection systems are a prevalent and integral part of all types of buildings and structures, whether in the oil and gas industry or the offshore wind industry. Such systems are generally tailored for protecting people and equipment against three types of fire classified as cellulosic fire, hydrocarbon fire, and jet fire (which is part of a hydrocarbon fire event). In terms of fire protection, the main difference between these types is the time it takes for the fire to reach its absolute maximum temperature. 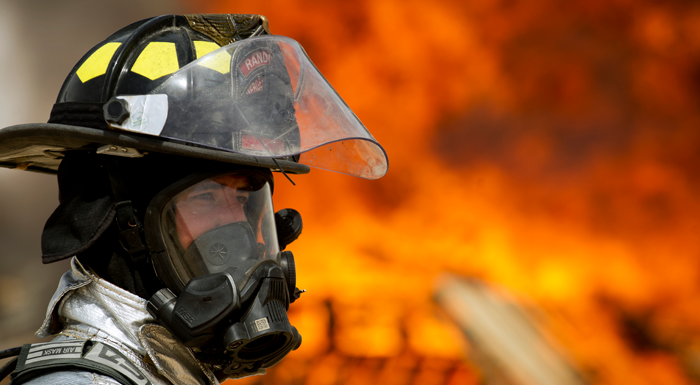 This article will take an in-depth look at the proper fire protective solutions for hydrocarbon fires. 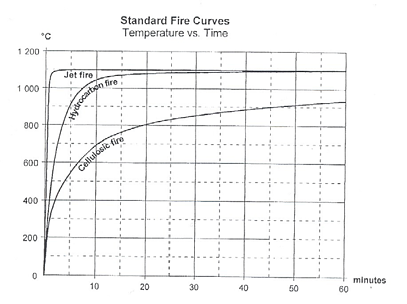 According to the graph above, jet fire and hydrocarbon fire reach their maximum temperature in a very short time. Hydrocarbon fire reaches a high flame temperature to 1000°C [1832°F] within 5 minutes, achieved almost instantaneously after ignition. The heat rises to 1100°C [2012°F] shortly after. The fire maintains its stability for at least 120 minutes. Such a severe fire event can cause substantial damages and is a great safety risk. The best solution to slow the spread and contain hydrocarbon fire is to install fire protective solutions such as doors, walls and windows which are hydrocarbon fire resistant and are rated accordingly. Compartments, where chemicals and other toxic materials are handled, commonly include doors with an H120 rating which provides the highest level of safety. Each compartment, therefore, needs to be assessed accordingly in order to determine the proper fire rating for the doors. There are specific requirements for fire rated doors. The door leaf and frame have to be constructed of steel or other equivalent material and insulated as necessary to achieve the desired standard of insulation. Fire rated doors usually need to have fire rated seals which commonly are composed of an intumescent material. An intumescent material chemically reacts to heat by expanding, which eventually seals the door edges. H rated fire doors also have the purpose to allow for safe evacuation of personnel and passage of firefighters to extinguish the contained fire. H rated fire walls must have the same fire rating as the doors within the same compartment. The same philosophy also holds for walls, namely, higher risk to hydrocarbon fire has to be mitigated by placing a H rated wall. . This could be e.g. between the oil and gas processing environment and the accommodation area where there is an internal risk of hydrocarbon fires and explosions. For the external part of the wall, the most common materials used are mild steel, stainless steel, duplex or plastisol. The inner layer of the wall is made of Passive Fire Protection (PFP) materials, which can be, for instance, ceramic wool. The internal liner generally consists of plastisol, galvanized steel or stainless steel. Fire rated windows are convenient when more natural light and visual sightings are required within a compartment. Since walls, doors and windows form a complete compartment, in areas where the risk of a hydrocarbon fire event is high the windows must have the same fire rating as the doors and walls. For windows, the frame and glazing bar are required to be engineered of mild steel or stainless steel and can be easily welded to fire rated walls. As mentioned before, all three elements of fire protective solutions form the final and complete architecture for the compartment. With the right fire rated solutions, people and equipment will be properly and safely protected against hydrocarbon fires. 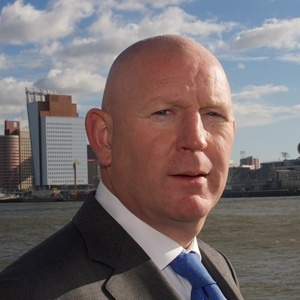 Want to know more about hydrocarbon fires and about the H rated fire solutions? Download our eBook Fire ratings for fire protective products!